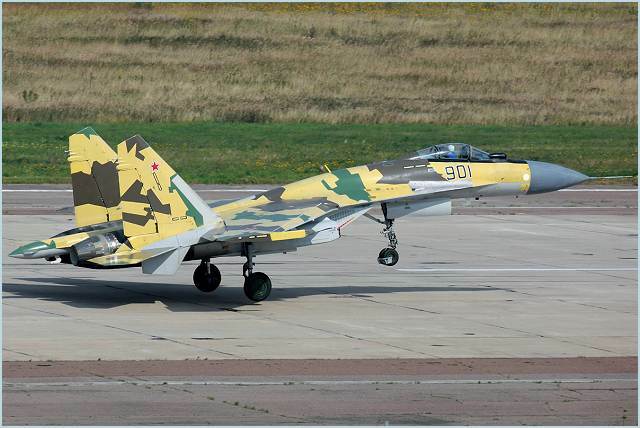 Russian Company Sukhoi began flight tests of the 3rd serial Su-35S Flanker-E fighter aircraft. Russian Su-35S-3 multirole fighter aircraft piloted by test pilot Taras Artsebarsky took off the airfield of the Komsomolsk-on-Amur Aircraft Production Association named after Yuri Gagarin (KnAAPO). Various modes of propulsion and integrated control system as well as stability and controllability characteristics were tested for more than 2 hours. Operation of engines, systems and equipment proved to be flawless. The Su-35 fighters have already flown more than 400 flights on the flight tests program. The first and second Su-35s were delivered to the 929th State Flight Test Center (GLITS) for the State Joint Tests (SJT), and on August 15 last year they started to implement the agreed program. At the same time the first serial production fighter — Su-35S-1 has also joined the program. The first and second Su-35s carried out preliminary flight tests. The basic set of flight and technical specifications of the on-board equipment and the characteristics of super maneuverability, stability and control characteristics, the characteristics of the power plant, the work of the navigation system were fully confirmed during the tests. The maximum ground-level speed is 1,400 km/h, speed at altitude — 2400 km/h, the ceiling — 18 thousand meters. The detection range of targets in the “air-to-air” mode is over 400 km. This is significantly higher than that of the combat aircraft currently in service. The onboard OLS (optical locator station) can detect and track multiple targets at ranges exceeding 80 km. The complex is ready to undergo testing for operational use.